Lagoon 206 is on the top floor of the 3 storey Lagoon Lodge with gorgeous views of Cats Eye Beach, Whitsunday Island and Coral Sea. This is 2 bedroom, 2 bathroom self contained, this apartment has everything you'll need to enjoy your island holiday. Relax on the new comfiest lounge and be overwhelmed by the sedative sound of the birds or turn on the large flatscreen TV to unwind. The apartment sleeps 5 people comfortably but can accommodate a 6th person in the rollaway bed. The master bedroom has a beautiful view, king size bed and stylish ensuite with bath. The spacious 2nd bedroom has queen & single beds. Internal Laundry, Views, Furnished, Modern Bathroom, Modern Kitchen, Renovated, Bath, Built in Wardrobes, Ensuite(s), Bbq On Balcony, Flat Screen Tv, Fully Equipped Kitchen, Valet Service, Complimentary Buggy, Surround Sound, A/c Throughout, Booking Agent On Island, Complex Swimming Pool, Linen And Beach Towels, Starter Pack Included. Lagoon 206 is on the top floor of the 3 storey Lagoon Lodge with gorgeous views of Cats Eye Beach, Whitsunday Island and Coral Sea. 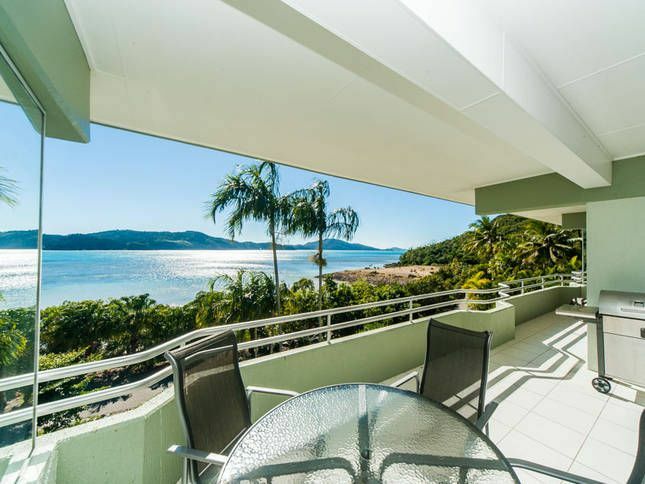 While enjoying your relaxing time just sitting on your balcony, you will be look out over the beautiful Whitsundays . The apartment is quite spacious and clean. We enjoyed our stay there. The staff is really friendly and helpful! Had a great stay at lagoon 206. Very nice clean bright spacious apartment. Excellent property; clean, very comfortable, spacious, great location, use of buggy was fantastic, all kitchen facilities were clean and working. Highly recommend this property to family and friends.